In the 1930’s, with the threat of war looming on the horizon, the Canadian Government started looking for likely sites for military airfields. The area of the present Victoria International Airport was selected as it was a large flat place in an otherwise rugged area. In December of 1936, a reconnaissance party under F/L F.J. Mawdsley flew from Jerico Beach, Vancouver, to make initial preparations to establish an air station at Patricia Bay. Surveying for the Patricia Bay aerodrome and seaplane base started on March 29, 1939. In September 1939, the Royal Canadian Navy at Esquimalt, No. 111 Coast Artillery Co-operation ( C.A.C. ), was mobilized with Avro 626 aircraft. The Artillery took over the Jones Farm at Pat Bay for its initial base of operations. Meanwhile the air station was rushed into being. On October 22, 1939, R.C.A.F. Flight Lieutenant George Walter DuTemple and Corporal Rusty Hopper left Sea Island in Vancouver at 14:30 hours in an Avro 626 biplane. At 15:11 hours, DuTemple landed his plane at Pat Bay. Shortly after, the Royal Canadian Air Force Ensign was raised over Patricia Bay Air Station for the first time. In November 1939, Western Air Command moved to Victoria to allow closer liaison with Military District No. 11. 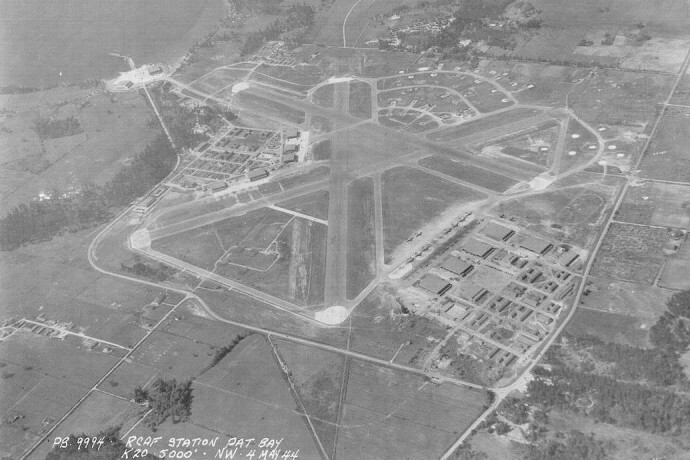 The station was initially intended for the Commonwealth Air Training Plan, but there were eventually three separate camps using the runways and control tower. 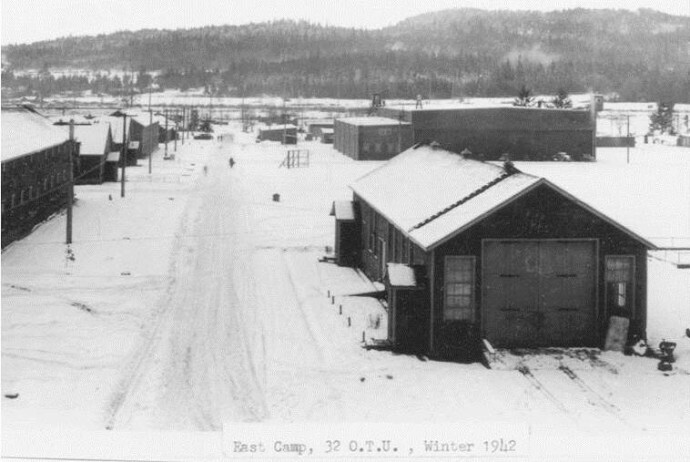 The West Camp, housing the Royal Canadian Air Force No 3 Operational Training Unit, and fighter and bomber squadrons. The East Camp, housing the Royal Air Force No 32 Operational Training Unit. This unit trained aircrew from England, Australia and New Zealand. The Seaplane Base, which served also as a coastal patrol base and was part of Western Command's defence against Japanese submarines. In May 1940, the Royal Canadian Air Force moved into its West Camp with a strength of four Lysanders. In its early days, the Patricia Bay facility was the third largest station in Canada. Approximately 10,000 military personnel passed through Pat Bay, and at any one time, 3,500 could be enrolled in the operational training programs. Aircrew, ground crew and support personnel participated in the training programs. This was the last step in their training, and graduates would be posted directly to operational squadrons. In the East Camp which housed the RAF operations, a newsletter called the Patrician was published from October 1941 to 1945. Copies of the newsletter have been digitized and can be viewed here. Pat Bay was also a base for coastal patrol aircraft and fighter squadrons. This role was particularly important to the defence of both the US and Canada after Pearl Harbor. During the war, many different operational squadrons called Pat Bay their home. One of the aircraft types stationed at Pat Bay, the Bristol Bolingbroke, was the first to successfully attack a Japanese submarine off the West Coast. Many other operational types, such as the Curtis Kittyhawk and Hawker Hurricane fighter were also located here. Of course, with training and operational activities, there were accidents. Over 100 aircrew lost their lives. These lives are commemorated in the Memorial Room at the British Columbia Aviation Museum and a plaque at the Victoria International Airport terminal. Not much is left of the old camps. The British Columbia Aviation Museum is located on the site of the old East camp. In the Memorial Room of the British Columbia Aviation Museum you will find photographs, models and artefacts that chronicle the military past of the Pat Bay Airport. There is a model of the control tower and a typical WWII hangar surrounded by models of each of the aircraft types that were here. In our hangar, there are examples of actual aircraft that were stationed here during the war, such as the Bristol Bolingbroke, Avro Anson, and Noorduyn Norseman. Across Canora road from the Museum is Mary’s Bleue Moon Cafe, originally Mary’s Coffee Bar and a wartime hangout. It’s still there and decorated appropriately with wartime memorabilia and aircraft models. In 1944 the Royal Canadian Air Force West camp was the location for scenes shot for the movie “Son of Lassie”. The movie stared Peter Lawford and June Lockhart of Lost in Space fame. Peter Lawford played the role of an air force pilot who, with his stowaway dog, Lassie, is shot down over enemy territory. Of course Lassie is key to their escape. There are pictures of this movie event in the British Columbia Aviation Museum’s Memorial Room. One shows members of RCAF 122 Squadron posing with Lassie, Peter Lawford and other supporting actors. In another picture, Air Vice Marshall F.J. Heakes is presented with Lassie’s pup, “Miss Patricia”, by MGM director Sylvan Simon, August 14, 1944. At the end of the War, military activity at Pat Bay decreased. The Royal Canadian Air Force lingered until 1952. Today the airport is home to Canadian Armed Forces 443 Squadron. They fly Sea King helicopters and serve with the Canadian Navy aboard Canada’s Coastal Patrol Frigates. Commercial passenger service started as soon as the runways were ready. Trans Canada Airlines began service to Seattle, and Canadian Pacific Airlines had the licence to provide service to Vancouver. In 1943, TCA was also granted a licence to provide Vancouver service. In 1948 the airport was turned over to Transport Canada. 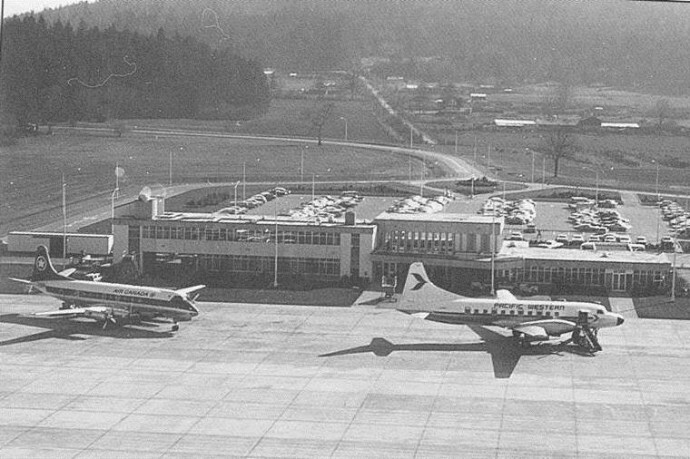 The name was changed to Victoria International Airport in 1959. Today the airport is a very active transportation hub. There are many aviation related businesses located here, including airlines, aircraft maintenance, air cargo, aircraft rentals, flying schools, charter airlines, fuel dealers and ground handlers, airport shopping, weather services, and of course, the British Columbia Aviation Museum. Since October 22, 1939, when Flight Lieutenant George DuTemple and Corporal Rusty Hopper landed their Avro 626 biplane at the Patricia Bay Air Station, the airport has evolved into one of Canada’s premier airports. Their historic landing was re-enacted on October 22, 1999, and a plaque commemorating the re-enactment was placed at the entry to the Museum.